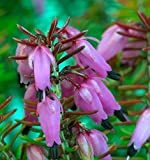 Erica carnea growing subshrub of the genus Erica also known as Winter heath or Winter heather, Erica carnea perennial evergreen used as ornamental medical plant and as ground cover plant, grow in temperate climate and growing in hardiness zone 5-8. Leaves color green grow in pinnate shape, leaf size 1-2 mm. Flower color can be: pink, purple, red or white the shape it’s from close bell to trumpet in the size 1-2 mm, flowers grows in the end of the stem. pink, purple, red or white flower, the shape it’s from close bell to trumpet in the size 1-3 mm, flowers grow in the end of the stem.